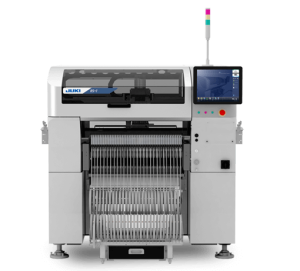 Juki Automation Systems (JAS), Inc., a world-leading provider of automated assembly products and systems and part of Juki Automation Systems Corporation, was awarded three 2019 NPI Awards during the 2019 IPC APEX EXPO. The company won in the category of Storage Systems for its Autonomous Material Handling System, Labeling Equipment for the new Incoming Material Station, and Pick-and-Place – Multifunction for the RS-1XL Placement Machine. Juki’s new Autonomous Material Handling System consists of the ISM3600 and ISM3900, an interface module, an elevator unit and an Autonomous Intelligent Vehicle (AIV) designed to work as one unit. The company works with third party AIV partners to custom develop automated material handling solutions to move trays of ISM reels and trays to and from Juki mounters, feeder-bank trolleys and feeder setup stations. 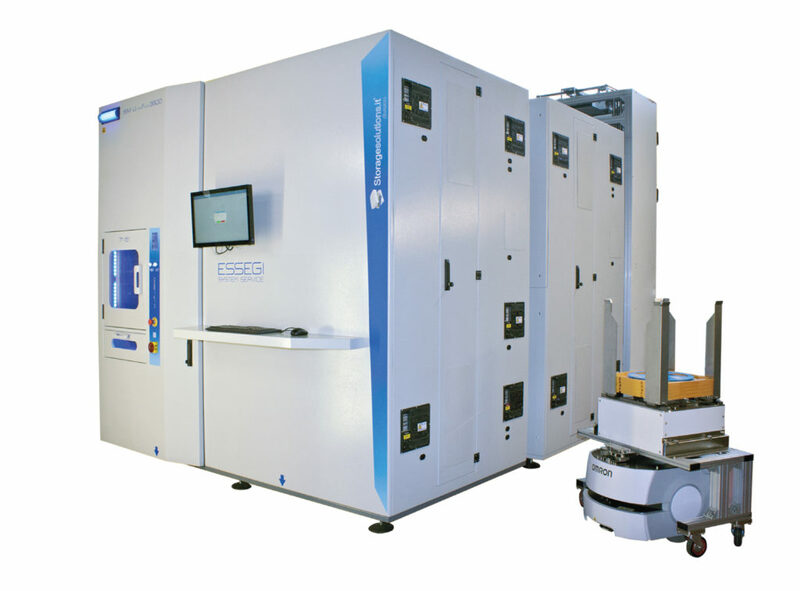 The complete package provides the unique ability to automatically store, retrieve, deliver, and return components throughout the factory. Components can be taken by the AIV from the main warehouse to the storage tower and any other location where they are needed. With the Incoming Material Station, operators can speed up material registration activities, avoid mistakes, and increase the traceability of each individual reel or component package. With its Auto-Incoming features, it is possible to automatically import information from the supplier and/or customers’ label into the ERP and print a new Unique ID that can be used for many other functions within the factory. In fact, after setting the rules for each supplier’s label, the operator can simply position the material on the Station and the high-resolution camera will read all the needed codes and information, take a picture for traceability purposes and print the new label. The RS-1XL offers all the same features of the proven RS-1, but with a standard maximum board size of 650mm x 560mm. The LNC-120 laser used in the new Juki TAKUMI placement head rapidly, and automatically adapts to and compliments geometry in-flight 3D measurement, making it the ultimate line balancer. 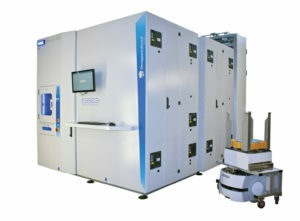 The laser moves up and down depending on component height, resulting in the highest CPH regardless of component height. Combined with the RF electronic feeders, the system has an optimal throughput of 40,000CPH. With new odd-form recognition technology, the RS-1XL provides easy data entry for odd-form parts. 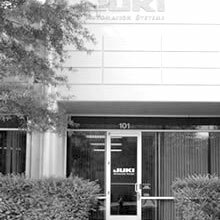 For more information about Juki, visit www.jukiamericas.com. Smart. Fast. Modular. – Supporting Industry 4.0 Intelligence and Connectivity. 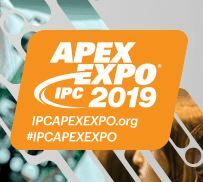 Stop by Juki’s Booth 2541 at this year’s IPC Apex Expo at the San Diego, CA convention center to see a complete set of integrated products designed for the future of electronic manufacturing. Designed as an extension module for the ISM UltraFlex 3600, JUKI’s ISM UltraFlex 3900 offers a thought-out solution to efficiently use space in the warehouse by simply and quickly doubling storage capacities. During the fully automatic import and export of components of up to 54 reels there is no user intervention necessary. In the meantime, the employee can easily work on another task at hand. On top of that the automated storage saves valuable time, which would be lost when using a traditional high-bay racking system for the manual picking and packing as well as the retrieval of material. The flexibility of ISM UltraFlex 3900 storage solution enables storing of up to 7,500 (7“ and 15“) reels in combination with JUKIs ISM UltraFlex 3600 on an effective area of only 7.5 m². With help of the optional humidity control module it is possible to constantly adjust and monitor the humidity within the system. Hereby maintaining an internal environment below 5 % RH and thus protecting sensitive components from humidity. On top of that the software keeps record of the predominant humidity during the whole storage cycle of the component. 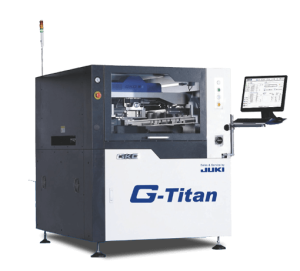 The G-Titan comes with multiple standard features and performance, plus additional options to take your manufacturing to the next level. With the SPI Close-loop system, the machine will automatically adjust and correct the print deposits based on the feedback given with regards to poor printing quality. The RS-1 supports components from 0201 metric (008004″) up to 74mm square and 50mm x 150mm rectangular parts for maximum flexibility. 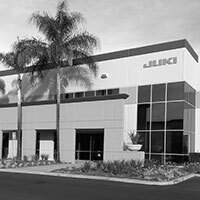 Juki Automation Systems (JAS), Inc., a world-leading provider of automated assembly products and systems and part of Juki Automation Systems Corporation, today announced that Horizon Sales now represents the company in Florida. 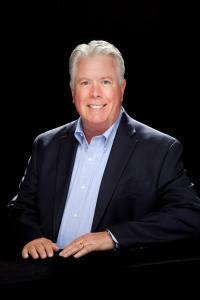 Horizon already manages and sells Juki equipment to the mid-western states of: Michigan, Ohio, Indiana, Kentucky, Western Pennsylvania, Illinois, Eastern Iowa and Wisconsin, and has now expanded into Florida. In business for more than 25 years, Horizon offers state-of-the-art equipment and supplies to its customers, helping them to achieve best-in-class status in their respective markets. Horizon Sales has continued to stay a step ahead of that technology curve, so when the time is appropriate for their customers to rise to the next level in their technology and manufacturing skill set, Horizon Sales is there and fully prepared to offer the solutions they will need. 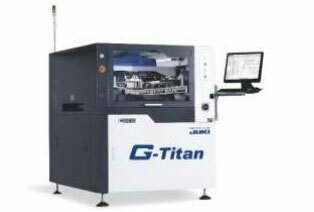 Juki’s sales team will demonstrate the new G-Titan Screen Printer, ISM UltraFlex 3600 Storage System and RS-1 Placement Machine. The new G-Titan Screen Printer is equipped for lights-out manufacturing and quality print control, which sustains optimal print conditions. The printer features a new interface with a modern look and many standard features, including: touchscreen LCD, stencil inspection, solder paste rolling measurement, stencil flattener, support block crash prevention, and automatic solder paste dispense (500g jar). Capable of providing up to 54 reels (7” diameter, 8mm wide) for production simultaneously, the ISM3600 can read low parts, warning to output the required reel in advance. With the capability to grow reels up to 88mm in height, the ISM3600 is the next piece in building out your smart factory. The mid-speed RS-1 features one multi-function head New Head – the LNC120 with a 12mm pitch and eight nozzles as well as a diffuser for vision. The LNC-120 head laser moves up and down depending on component height, resulting in the highest CPH regardless of component height.